Afzal Kahn is back with his latest take on the award-winning Range Rover Evoque. The Evoque is following the Range Rover Sport and Sport 300 as the latest recipient of the A. Kahn Design Vesuvius treatment. Afzal Kahn&apos;s crew has given the award-winning Land Rover model a makeover complete with new styling on both the exterior and interior. Starting on the exterior, Kahn has fitted a bright orange body kit (indicative of Vesuvius packages) with matte gray touches. The kit includes revised bumpers, stainless-steel door sills, side vents, rear diffuser, carbon tailgate trim and carbon fiber pieces. A high-flow exhaust system has been added long with a lowered suspension, giving the Evoque a sleeker profile while it sits on a set of big 21-inch Kahn RSXF wheels. The interior is where Kahn deviates from standardized work, as each model has customizable options on everything from technology to color. Seen here is an exterior matching orange and black combination which features quilted leather and Alcantara with slick contrasting stitching. Piano black trim and custom floor mats finish the model off on the right foot. 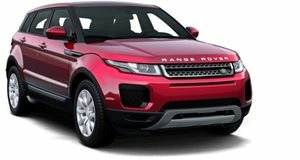 The Land Rover Range Rover Evoque Vesuvius Edition by A. Kahn Design starts pricing at £48,875.